History: the company Van Gaever & Co was formed in December 1997 by Freddy Van Gaever. Operations began in 2002 as VG Airlines (this name was officially adopted on June 13 2002) to provide scheduled services to long haul destinations with three ex Sabena A330s and former Sabena staff. The first aircraft arrived at Brussels on March 14 2002, the second on April 17 and third on June 7. The Belgian CAA was in no hurry to give them an Air Operator's Certificate, which led to financial difficulties even before the first flight took place. Financial injection was sought and found with Antonius Gram head of Kipling and Delsey (suit)cases. First revenue flight took off to New York on May 23 2002, followed to Bosten on June 20. In cooperation with Armenian Airlines Yerevan-Brussels-Los Angeles was started on June 30. Lack of a good advertising campaign and troubles with the ticketing reservation system in the States led to very poor inbound load factors. On August 8 2002, after A. Gram took full control, VG Airlines was renamed to Delsey Airlines. From September 23 on, feeder services were started from Frankfurt: German company "BerlinJet" leased a Brasilia EC-HFZ from Spanish lessor "Ibertrans" but their financial troubles halted these flights on October 3 as the airframe was repossessed. A total of 14 flights were made under Ibertrans callsign without ever reaching their proposed three daily rotations. Meanwhile, the take over of ill fated Air Holland was also not a smart move by A. Gram, so own financial troubles did further increase and led to a suspension of the flights to Boston and New York on October 8 2002. 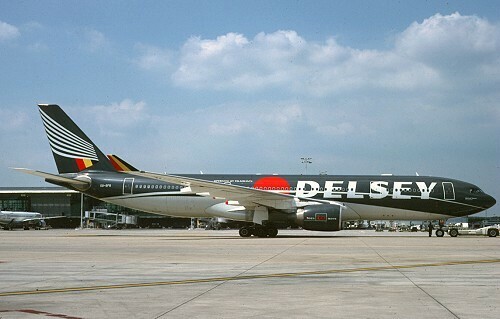 During the same month there was a financial dispute between Armenian Airlines and Delsey which led to enormous delays on its only operational flight to Los Angeles. After a brief resume, it ceased all flying operations on October 23 2002 and went bankrupt on November 6 2002.